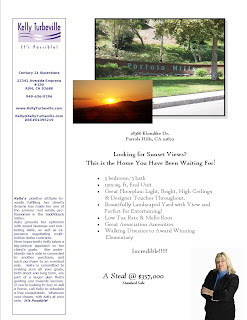 PORTOLA HILLS LIVING by Kelly Turbeville: 28366 Klondike Dr, Trabuco Canyon (Portola Hills) It's A Beauty! 28366 Klondike Dr, Trabuco Canyon (Portola Hills) It's A Beauty! Ok Portola Hills Residents make sure to tell your family and friends about our newest listing, located in the Montecido Tract of Portola Hills. This one has it all, location, views, and is waiting for someone to have a house warming BBQ in the great yard! This model is rare, it has 3 bedroom and 3 bath. Two Master Suites upstairs and 1 bedroom/Den/office with a full bath downstairs. Plus light and bright, cathederal ceilings and lovely windows to see the view. Contact Kelly today to schedule a showing!